He turned around, walking towards the tiled roof house located deepest in the backyard. Ye Qingyu was somewhat puzzled, but under the grinning direction of Wen Wan’s gestures, he followed the two towards the tiled roof house. It looked like Wen Wan and the black bearded man knew each other from before and had mentioned Ye Qingyu in their previous conversations. Within the tiled roof house, the lighting was dim. Within the house there were tens of weapons holders, displaying an assortment of weapons. Just from a glace, there were swords, spears, axes, tridents, all eighteen different kinds of weapons. The model of each weapon was not ordinary with each weapon emitting a cold, dense light. Compared to the weapons placed outside in the armoury, the craftsmanship was evidently better by several times. “It’s this one. Little fellow, if you can lift it, then you can take away. The black bearded man said, pointing to a dim corner. Ye Qingyu’s gaze followed in the direction of his finger. Leaning against the corner, was a black coloured weapon. It was a spear, longer than a normal spear with it being around three metres tall. There were two blades sticking out from the head and bottom of the spear, with the length of the blades being around half a metre. * It was truly a strange looking weapon. What kind of weapon was this? Ye Qingyu walked closer, holding the spear with one hand. The instant he touched the spear, he felt a warm feeling as if he was touching a smooth piece of jade. This caused him to be taken aback for a bit. The rough and shoddy appearance was in reality carefully engraved grooves and carvings, able to increase the friction of the grip and prevent it from slipping due to sweat. Much attention was placed in the details. He exerted some strength onto his wrists, lifting up the strange spear. Ye Qingyu heard this, and observed more carefully. Then he discovered it was a two pointed spear, with a blade on top and bottom. He carried the spear into a free area outside of the tiled roof house. With a flick of his wrists, suddenly the thunder like whooshing sounds of the spear emitted. Through the movement of the body of the spear, both ends of the spear created spinning circles in the air, blooming like a black flame! Ye Qingyu felt that this kind of weight was the most suited for him. It really was the weapon that was most comfortable for him, in all the weapons he had tried today, causing him to uncontrollably laugh with excitement. At this time, those who were training in the backyard also gathered over. Seeing this sight, they were all stunned, their chins wide open in shock. “This is herculean strength, where did this little fellow come from? The young men with bare arms surrounded Ye Qingyu, discussing heatedly. “But since you can swing it, then I’ll gift it to you.” The black bearded man gave off a smile. He waved his hands and threw a pale blue scroll, landing in Ye Qingyu’s hands. “This is a basic spear technique, return and go play with it for a bit.” The middle aged man smiled. “Thank you.” Ye Qingyu bowed with sincerity. “No need to thank him, that is something he should do.” The burly instructor Wen Wan did not treat himself as an outside at all, laughing. In this regard, the black bearded man had obviously seen Wen Wan’s ‘shameless face’ before, rolling his eyes. “But this spear is too long, it’s inconvenient to carry…” Ye Qingyu was a little worried. Did he really have to buy interdimensional pouch just to store the spear? He really did not have that much money. Ye Qingyu was taken aback. He examined the spear in detail, really finding a small catch. The middle of the long spear was indeed a bit thicker than the other two ends. 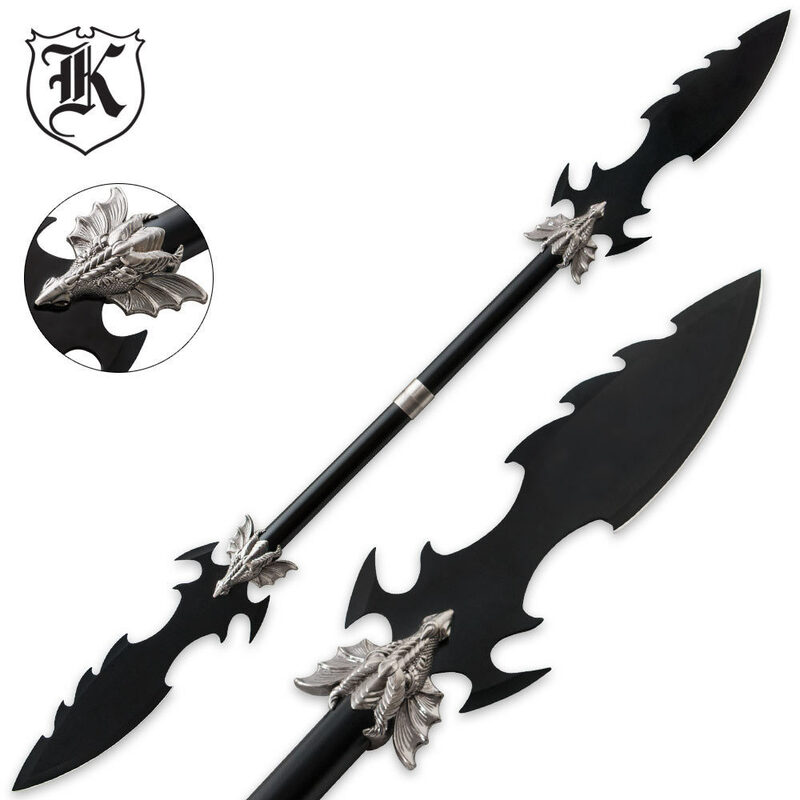 With a twist and a pop, the spear split into two with each end of the spear having a handle. In each of Ye Qingyu’s hand was a half of the spear. Because of the two foot long blade, it looked like that in each hand he was holding a peculiar sword. Each half of the spear weighed six hundred and forty four pounds, and when swung, would seem even lighter. In this way, the two halves of the spear would each be one metre and seventy centimetres in length. If it was carried on his back, then it would no longer be so eye-catching. Exiting from the free armoury, on Ye Qingyu’s back was the two halves of the spear carried in a wild beast holster. It made him look especially heroic. He was only fourteen years old, but he was already one metre and eighty centimetres tall. With a naturally muscular physique, and having this kind of equipment, made him seem particularly valiant. “Thank you old** Wen, I’ve caused you trouble.” Ye Qingyu slapped Wen Wan on the shoulder. These days, the two people had gotten extremely close to each other. The original relationship of teacher and student quickly became a relationship between scoundrels, and the way they spoke to each other became even more casual. “Haha, its only a little thing. I only borrowed flowers to present it to the Buddha***, that’s all.” Wen Wan said, immensely proud of himself. Ye Qingyu only smiled but did not say anything. But he knew, Wen Wan had long considered the problem of the wilderness test. The spear was evidently a result of his hard efforts in searching for a suitable weapon for Ye Qingyu. Otherwise, today in the backyard, the black bearded man would not have given him the spear so easily without Wen Wan’s help. Ye Qingyu could tell that the relationship between Wen Wan and the middle aged man with the surname Cao was not trivial. He did not know what kind of position the group of men had in White Deer academy that they were able to live in academy buildings. But since Wen Wan did not say anything, Ye Qingyu did not ask. After saying farewell to Wen Wan, Ye Qingyu returned to the dormitory. The old crabby janitor had never spoken to the students before and was always extremely strict. Everyone had assumed that he was a mute, but today he would actually call his name for the first time? “There are some thing for you. The little loli delivered it, she said she had something to give you but after waiting for half the day, she left it with me to hand it to you.” The old janitor handed over an exquisite little pink pouch, then promptly ignored Ye Qingyu, closing his eyes and resuming to snooze. Ye Qingyu looked at the fragrant interdimensional pouch, recognising it as something that Song Xiaojun would normally carry with her at all time. Ye Qingyu did not know whether to laugh or cry. This little girl, had already thought of all the things he might need. But the items she packed were clearly items that was used in a holiday, and not for a dangerous wilderness survival test. But looking at this interdimensional pouch, Ye Qingyu could imagine the little loli going back and forth deciding what to buy for him. These things look as if it was worth far less than the [Arctic pelt] Ji Lin gave him****, but in Ye Qingyu’s heart, the value was the same! This represented a young girl’s heart. It was the concern of a true friend. “Eh? There’s also a piece of paper…” Within the interdimensional pouch, was a carefully folded piece of paper. The words were written down in an extremely hurried fashion, evidently something that the little loli had quickly written before being dragged away by her sister. After Ye Qingyu had finished reading, he carefully considered. That madman…If he really came looking for trouble, then he should not blame him for being merciless! He returned to the dormitory and inside, his three roommates were in the midst of discussing something excitedly. Hearing the sounds of Ye Qingyu coming back, their discussions immediately stopped. Ye Qingyu ignored the three, heading straight to his room. He began training, to keep him at his most optimal condition. When it was around midnight, he opened the spear technique manual. After reading the general gist of it, Ye Qingyu could not help but laugh. On the blue scroll there were some of the most simple spear stances recorded and some common knowledge about spears that everyone knew. It was not a specially designed manual just for the [Inexorable spear]. Ye Qingyu was not disheartened. Ye Qingyu continued to train like he had in previous days. After practicing several repetitions of the spear techniques in the practice grounds, and eating breakfast at the canteen, he returned to the dormitory for a quick wash. The sun had just risen, creating a white sky in the dawn. ** think I forgot to mention, old is usually a term of affection for those older than them. ***Chinese idiom, meaning to win favour or influence using someone’s else property. ****wtf author, who is Ji Lin and what are you smoking? Should be a character he deleted, since there is no one called Ji Lin that appears. Thanks for the update! The loli is already giving a strong showing for best girl, although we haven’t seen a lot of them so far. Haha, true. She’s my favourite so far too. disappointed that not a heavy sword……. spear testing i immedialty thought of Sun Wukong trying weapons..
“Metres” should not have the “s”. Since “items” is plural, “were” should be used instead of “was”. If this is a proper noun, both words should be capitalized. “Artic” should probably be spelt “Arctic”. After “tell”, you should probably add a “you”. Instead of a comma, you should either add a colon (:) or a period or else the sentence is a run-on. woo—-! nice, a spear! that’s so heavy,though— well, it’s certainly suitable for ye qingyu! now, if we can just find someone to engrave runes on it, or something…. aw, true friendship, true friendshio! so nice! basics are important, that cannot be disputed!it si the foundation, after all! lol, yeah, i was wondering who this ji lan is…hahaha! you said it so amusingly though! Thanks a lot for these chapters. I think that you should advertise your website more. I found this website by pure chance on http://www.novelupdates.com/series/immortal-god-emperor/. You should post it on wuxiaworld translation forums. Keep up the good work and ignore the haters! Ikr!! Spears are my favourite mêlée weapons!! It needs more love!!! Oh and Loli best waifu!! Am I the only one who found the note about “Ji Lin” hilarious? Like cmon, that sentence is gold and a big thank you for the translation. What the spear might look like. When he was at the entrance to the dormitory, the white haired janitorwho usually spent the majority of the time snoozing on the chair at the entrance, suddenly opened his eyes.